Pineapple Pudding is a refreshing dessert; the golden Pineapple and the silky Panna Cotta is just the perfect combo for a delightful sweet treat. For all your special occasions, Pineapple Pudding is just the wonderful finishing touch that you need. Also known as “Ananas”, Pineapple is a popular fruit used in cuisines all over the world. It is oaded with antioxidants and helps to boost the immune system. Homemade Pineapple Jam tastes awesome and refreshing. You can prepare that in advance and the rest is just cake walk. For step by step Pictures of making Pineapple Jam at home, check my Pineapple Jam Roll recipe, another wonderful way of enjoying this wonder fruit. If you have a sweet tooth, do check my other dessert recipes, like, Apple Biscuit Crunch, Fruit trifle delight, Double Ka Meetha, Tender Coconut pudding, Golden Gulab Jamuns, Chocolate Biscuit Pudding etc. 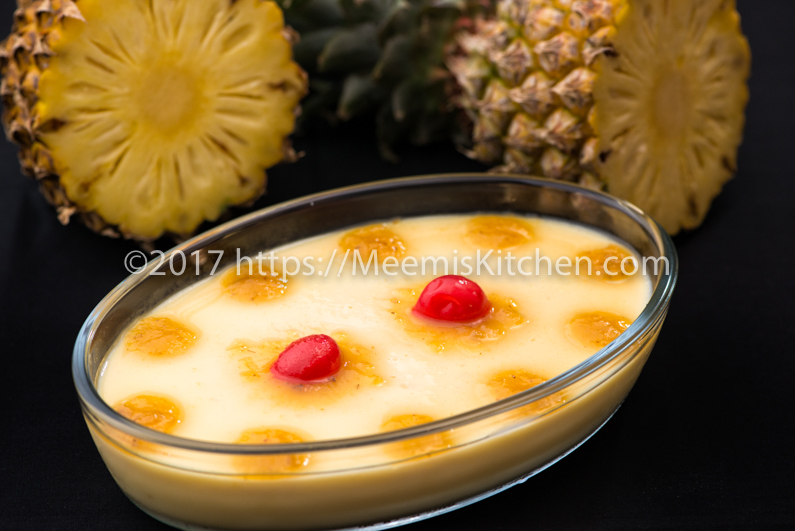 I haven’t used Gelatin in this Eggless Pineapple Dessert, so this can be enjoyed by pure vegetarians also. 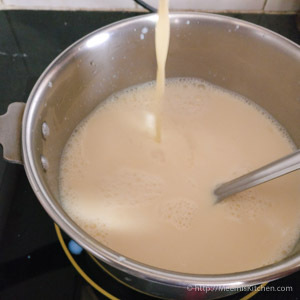 Also, check the yummy sweet Payasam/ kheer recipes like Palada Payasam, Mathanga Payasam, Sweet Potato Payasam, Parippu Payasam etc. It is cool, pleasant Climate in Bangalore now; the time to indulge in all temptations! Last week, it was creamy Pasta and today it is the Pineapple Pudding in my fridge, that is melting all my resolves. I took one spoon of that golden beauty and couldn’t resist the second and third spoon helping (I meant Table spoons, in case you thought I was very modest), so, just relax, happily indulge, and do it my way, extra walks for a day, after all, it is lovely weather!. Here is the much-awaited pineapple pudding recipe. Dedicating to all my loving friends in the apartment, who were asking for this recipe. Enjoy! Clean and cut the pineapple, carefully removing the brown prickly spots, without losing much flesh. Remove the middle part and cut into small pieces. Grind without water to make grainy Pineapple pulp. Pour in a pan and add cloves and cardamom and boil, stirring occasionally, to make it dry. Add sugar (adjust measure as per the sweetness of the pineapple), stir to combine well and continue heating it, till you get a smooth jam. Keep aside for cooling after removing the cloves and cinnamon pieces. (For step by step pictures of making Pineapple Jam, check: Pineapple Jam roll recipe). Cut the China Grass (Agar agar) into small pieces and wash it in water. Take a thick bottom Pan and pour china grass and half cup water, heat it on low flame till the China grass melts completely. (Stir to avoid lumps). Keep aside half cup milk and mix the rest of the milk with the milk maid in a sauce pan. Keep on medium flame and heat the milk mix, stirring continuously. 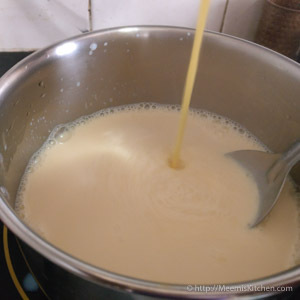 In half cup milk add sugar and Custard Powder and pour it to the hot milk mixture and stir well to combine. 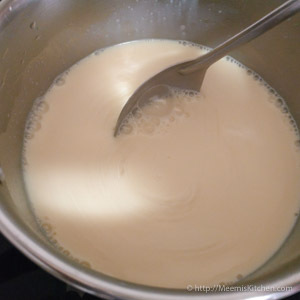 Switch off the flame and add the melted China grass to the milk mixture. You may use a strainer to pour the china grass or strain it after mixing to avoid any residue of China grass. Take a glass bowl or ceramic bowl and pour the hot Panna Cotta mix to the bowl. Allow it to cool in normal temperature. When it is almost set, decorate with Pineapple Jam. Cover and allow to cool in the refrigerator. Serve cold. You can make more quantity of pineapple jam. Kids would enjoy the homemade Jam. Store it in refrigerator. China Grass should be plain. If you use flavoured china grass, it will spoil the taste. The melted china grass should be mixed with Panna cotta mix and strained to avoid any residue. Combine the China grass when the Milk mix is hot. Stir for few seconds to avoid any lumps. Pudding can be set in Glass trays or bowls. You can add 1 tsp Pineapple Jam to the Panna Cotta mix if you like to have more pineapple flavor. Please try this refreshing and delightful Pineapple Pudding. If you like this recipe, please encourage me by commenting below or by sharing with your friends using the links on the side. God Bless!! 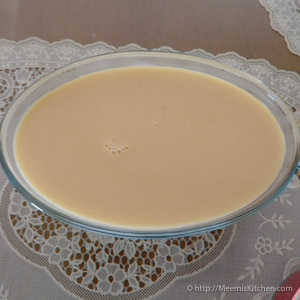 For this pineapple pudding can I use agar pd.And how many spoons.yummy receipe want to try. Monica, you may use Agar Powder for this recipe. 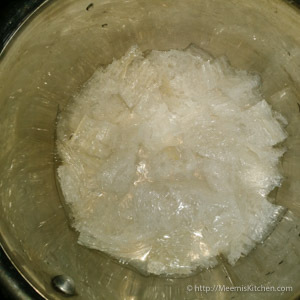 You may use 2 tsp of Agar Powder for this recipe. Mix it with milk and bring to a boil. Please try and let me know.